We will practice a rejuvenating Hatha Vinyasa flow based on the chakra system with explorations on pranayama and meditation. After breakfast we'll have a daily workshop to deepen your understanding of the chakra of the day and fortifying our mind-body-soul connection through different practices and conversations. Afternoons are just for Yourself! Chilling, resting by the pool or exploring the beautiful surroundings of our location - rice field walks, spas and yummy, hip, healthy cafes and restaurants of the area. You will have a lot of places to explore within walking distance. We are located in an area that is very familiar to me, so I have the best tips to give you for your free time! We gather again for a sweet, nurturing 5 elements Yin Yoga practice that soothes your whole being, getting you ready for sweet dreams in the cozy bungalow with jungle sounds as your lullaby. 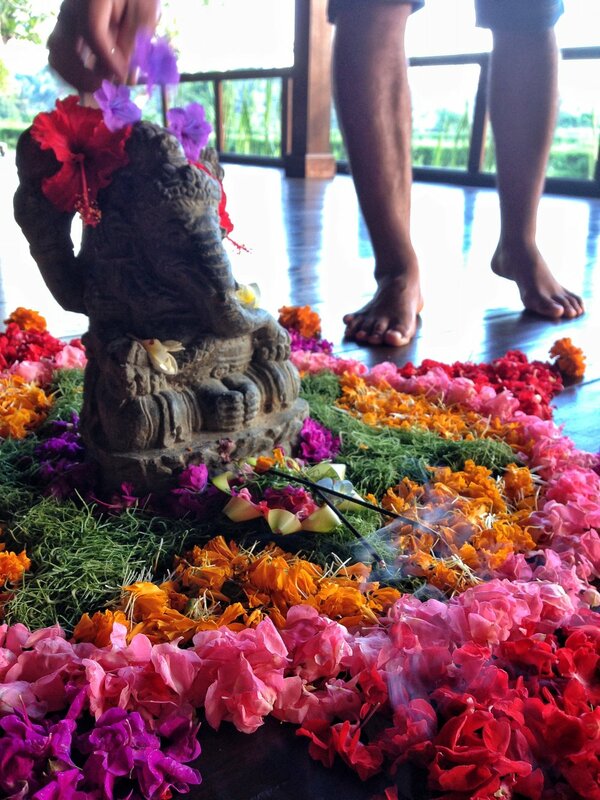 We will start our journey together with Balinese fire ceremony that will powerfully clear our energies and support us stepping deeper into the practices. During the retreat, we will also experience a sound healing group session and chanting mantras together in Kirtan. At the end of our week-long gathering, we will share a beautiful morning trip into an authentic Balinese water temple for a ceremony and purification with a Balinese priestess Jero Luh Manis. On our last evening togeher we will share a lovely last dinner together in world class vegan restaurant before we say goodbye to all the old and new friends made along the way. Accomodation, airport pick-ups, and delicious organic vegetarian/vegan meals are all incuded in the package. You will also have a detoxing morning bottle of green or fruit juice of your choice, freshly delivered from Wayan’s Juice Bar - an institution among yogis in the area. 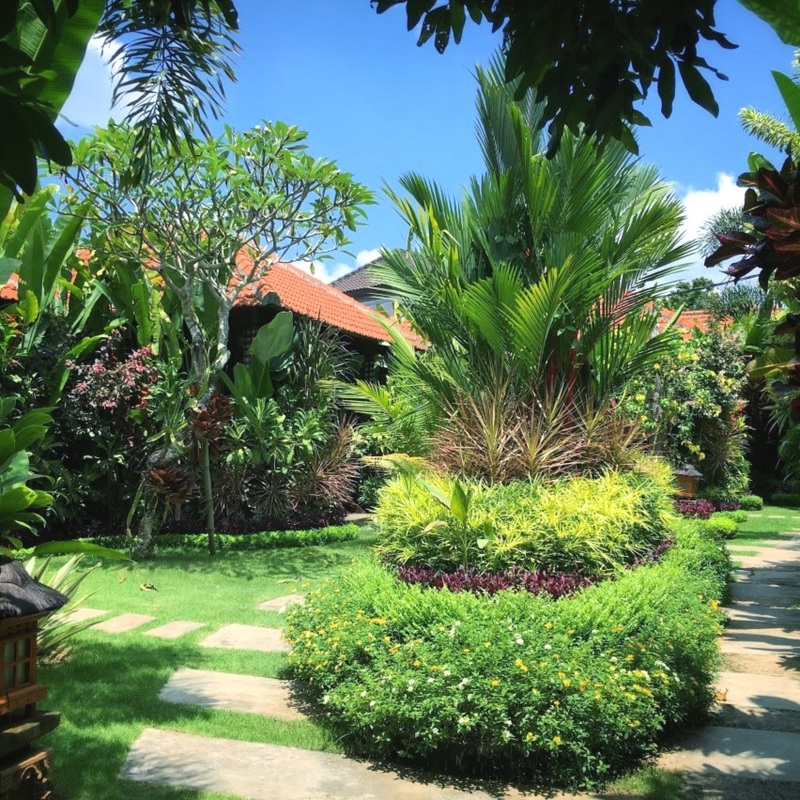 All is taken care for - so you can just enjoy your time for yourself in the lushness of Mama Bali! FOCUS ON your wellbeing, practice and relaxation! This retreat is for everyone with an interest to deepen their mind-body connection and understanding of yoga, in the divine surroundings of balinese nature. The programme is thoughtfully put together allowing you to immerse yourself into both dynamic and soothing yoga practices with explorations on your chakra system, pranayama, meditation, five element meridian system and healing power of sound. We aim to offer a safe transformational space for remembering your true nature and helping you connect authentically to your inner self through yoga practices. We will take this enlightening journey in an authentic, judgement-free and nurturing atmosphere, where you are accepted exactly as you are. Anu Karoliina is used to holding classes for mixed level groups of practitioners, so all enthusiastic yogis, seasoned or beginners will benefit from the practices and are equally welcome! We will be located in the outskirts of Ubud in the charming and peaceful village of Penestanan, which is one of the popular hubs for yogis and expats in the area. The village life is mellow and relaxed, and the area overall is very safe. Penestanan has a wide range of restaurants and cafes - popular hang-outs of the expat population. Yet everything quiets down early in the evening, so you can be sure of a good rest with usually only sounds of nature as your soundtrack. Our practices and our meals will take place in a lovely freshly built open air yoga shala called Nālandā. Our shala is beautifully nested away from the roads in a peaceful surroundings of gorgeous lush nature with a river running right below, giving a special touch to the atmosphere. Notice that your accommodation will be in a near by hotel Saka Village, a couple of minutes walk away from our studio. On the whole, our location is about a 10 minute walk from the road along the peaceful, yet paved paths that only allow scooters and pedestrians. This might be something that’s good to take into consideration while packing for your retreat. Our programme together starts on Sunday the 20th in the afternoon with an opening circle, dinner and the fire ceremony. The programme ends on Saturday 26th evening with a farewell dinner in a world class vegetarian restaurant. The check-out is on Sunday morning 27th of October. We will keep the right to confirm/adjust the final details of the programme according to the circumstances closer to the event. Anu started her journey of yoga in 2010 with the practice of Ashtanga Vinyasa, but later on found her home in more gentle practices of Hatha-, Flow- and Yin Yoga. Combination of these aspects of yoga gives her the practices she shares a unique combination of strength and softness. She eventually found her yogic ‘home’ in Bali, studying Yoga Pranala with her beloved teacher Linda Madani Grondin. Yoga Pranala combines yoga flow with sacred tradition of balinese hand mudras to invite a stronger flow of prana in the body. This marked a profound shift for her journey. Yoga Pranala started opening her not only physically, but mentally, emotionally and spiritually. She found that this practice was not only the key to reach the source within, but an incredible self healing tool as well. A tool she wants to share with everyone. Her teaching style is gentle and lighthearted, yet precise. She creates a warm, allowing atmosphere in her classes, so you are welcome just as you are. Have a peek on her approach to yoga and healing through her video The Gift of Yoga. Anu has studied Yoga Pranala with Linda Madani, Yin Yoga with Tina Nance and the traditions of Hatha Yoga with Mark Whitwell. She became a yoga teacher in 2015. She has international teaching experience from public classes and workshops for four years, mostly in Bali, but also in her home country Finland and France, where she is based now. She is also teaching in yoga festivals and facilitates yoga retreats in France. Born and raised in Bali, Luh Manis is a trained Jero, Balinese priestess who has responsibility to lead ceremonies in her local community. On becoming a Jero she found her sensitivity to energy heightened and she turned to yoga and meditation to balance it. She is also a Retreat Leader and a founder of Pranasanti which is founded on the traditional and uniquely Balinese philosophy of Tri Hita Karana, which translates as “three causes of well-being”. Through her tours , retreats , and classes at Pranasanti, Manis shares her passion for the nature, culture and spirituality of Bali with others who want to do something a bit different and delve deep into Bali’s culture, magic and ancient wisdom. She has since gained her 200 hour yoga teacher training from Shakti Mhi at Prana Yoga College. She now practices and teaches hatha and prana yoga, and meditation, full-time. She believe that her purpose is to help others find their hidden ability and gift by sharing her views , knowledge and wisdom from Bali to everyone she meets through her activities in a way that is deep, authentic and unique. OH YES, I’M READY FOR THIS! to keep our retreat intimate, We have a limited amount of spaces available. Be quick!